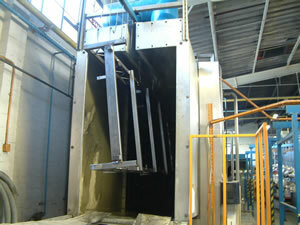 Degreasing is carried out online. A thin coating of iron phosphate is applied to help prevent corrosion, and aid paint adhesion. All degreasing is undertaken using a combination water based degeaser and iron phosphate solution. Etch Priming. We can apply two pack etch prime where required. Manual Surface Preparation. 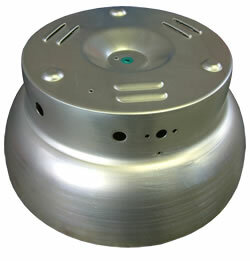 This component has been manually abraded to improve the adhesion of the powder coating. Also, if look closely you'll notice the small hole in the center has been masked. We also undertake manual degreasing, label removal and stripping of writing where required. Masking. We can undertake low and high temperature masking as required. We have a full range of plugs, caps, and tapes to suit most requirements. Other specialist making products such as slit cord and tubing as well as custom laser cut masking sheets can also be used.